LUANGPHO JOY (age 76, 2015 C.E. 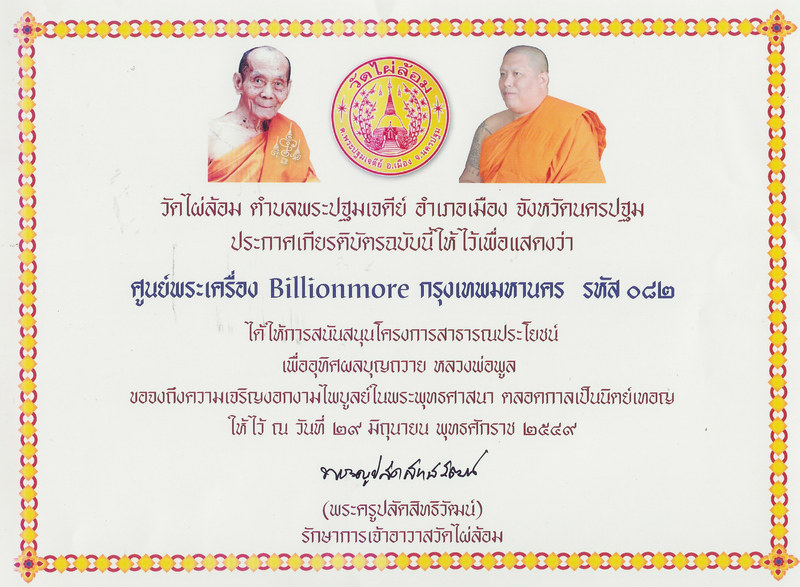 ), abbot of Wat Non Thai, Nakhon Ratchasima province is a famous guru monk whom people respect and the best disciple of Luangpho Koon, Wat BahnRai, Nakhon Ratchasima province, a highly esteemed guru monk of Thailand. LP Joy was born on 3 April 2482 B.E. (1939 C.E.) 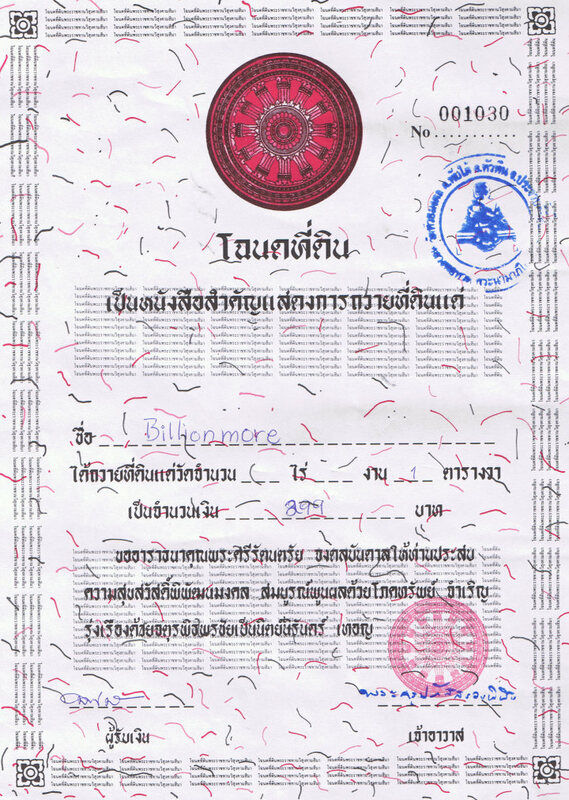 in Chaiyaphum province. 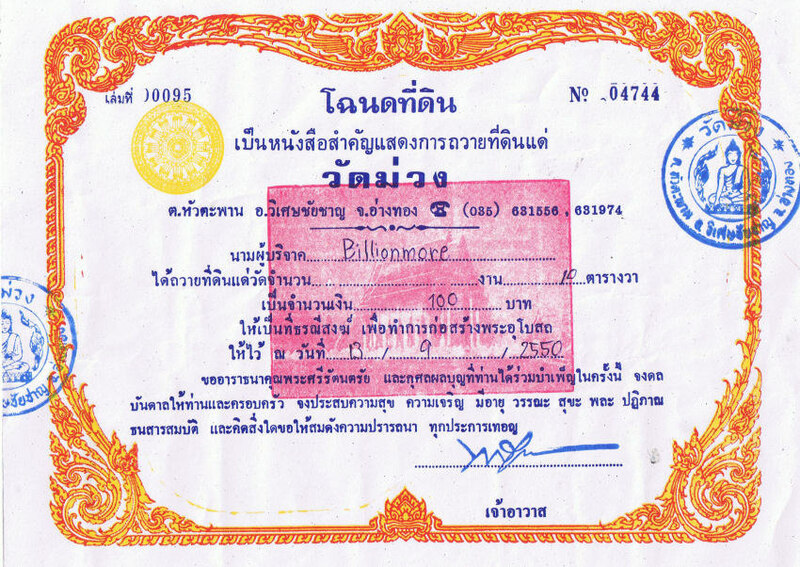 At age 24, he became a monk and got a monk name Chinnawangso. After ordination, LP Joy promised himself to be a good monk and try his best to serve Buddhism. 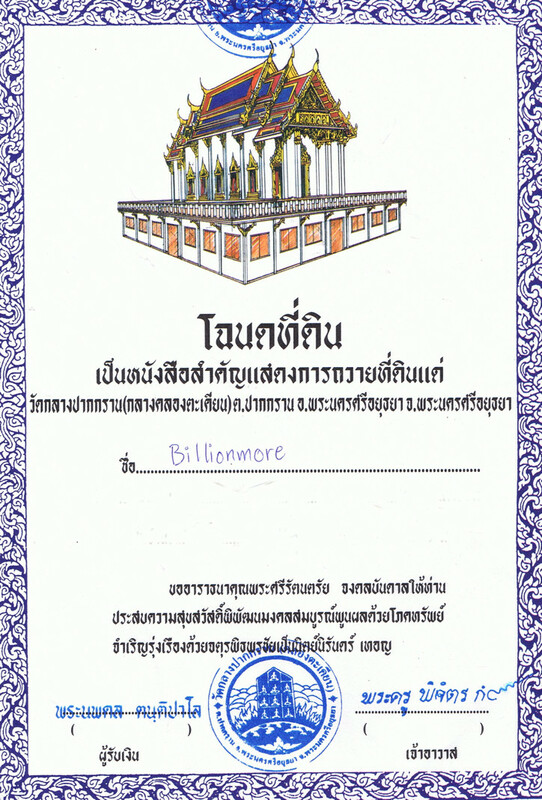 It is like what he intended when he established the school for monks and novices and developed his temple (Wat Non Thai) as learning center for Buddhists. LP Joy tries to promote Dharma of Buddha through religious activities such as chanting, meditation, sermon and regularly holding important Buddhist days such as Magha Puja, Vesak Puja and Asalha Puja. Since a newly monk until now, LP Jow always does meditation. He is solitary and simple that prefers to walk barefoot and sleep on a wooden pillow given by LP Koon of Wat BahnRai in order to keep conscious all the time. He said to use this wooden pillow all his life. First year of monkhood, LP Joy tried blessing an amulet. 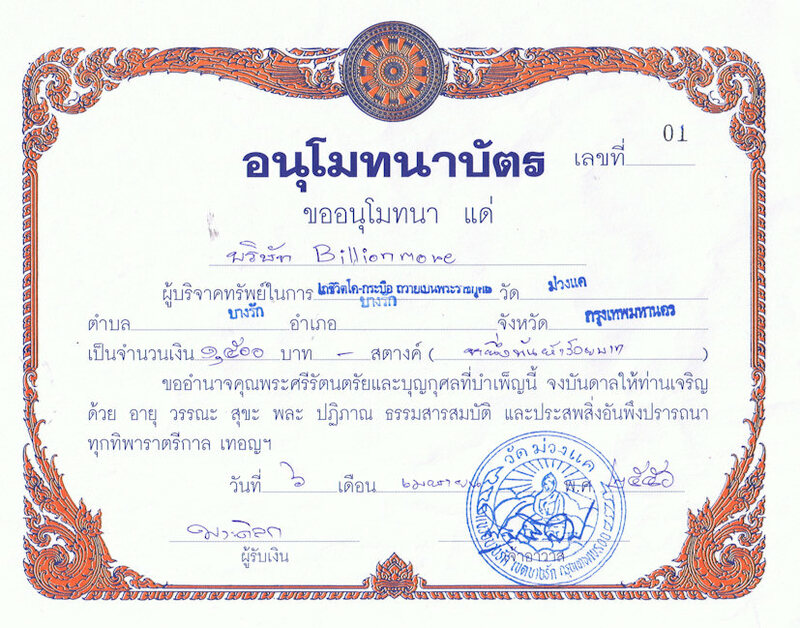 What he blessed was King Rama the Fifth Medal. Younger brother of LP Joy knew and wanted to prove the holiness. He brought his friend to prove by firing at the medal, but the bullet did not come out! In 2533 B.E. (1990 C.E. 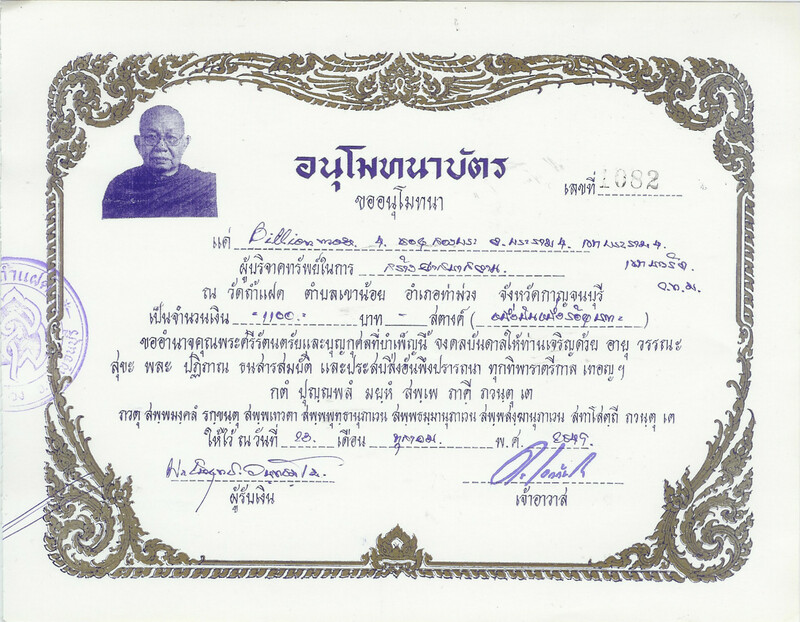 ), at year 27 of monkhood, LP Joy made 112 his own lockets for people to worship as very much request from disciples. People who wore the lockets experienced the real protective power. Therefore, LP Joy had to make more 300 pieces and they ran out quickly. In late 2536 B.E. (1993 C.E. ), during ceremony in the chapel, while LP Joy was blessing the amulets using a rosary altogether, one bead of the rosary suddenly broke among eyes of 34 monks and novices. Sound of breaking can be heard by ones in the chapel. 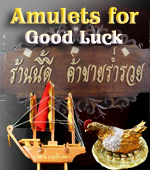 Wat Non Thai released amulets for worship in the annual temple fair on 2-9 February 2537 B.E. 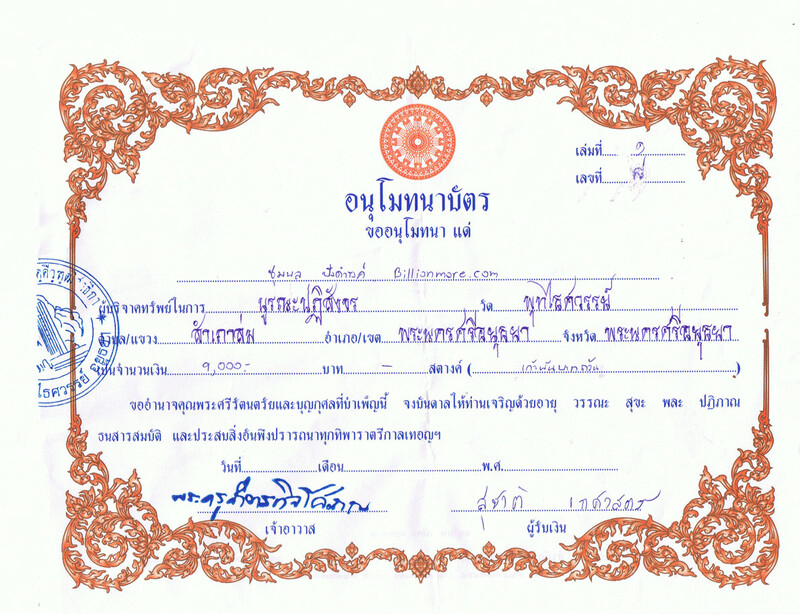 (1994 C.E.). A lot of people came and amulets ran out very quickly. People call amulets on that day Roon Prakam Taek that means Batch: Breaking of Rosary Bead. 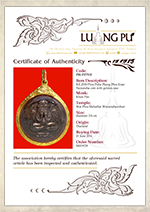 Ceremony: LP Joy blessed this Buddha medal properly on 3 April 2015. Power: "Phra" means "Buddha". 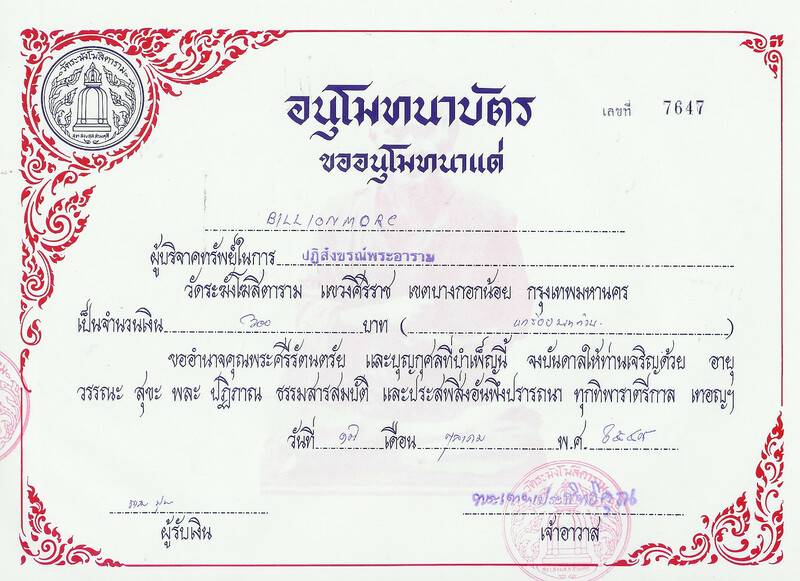 "Jow Sua" is a Chinese word for a millionaire. 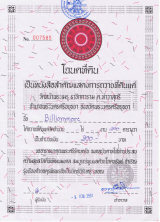 In Thailand, Phra Jow Sua is accepted as top Buddha Amulet of Wealth especially helping worshiper very successful in business. 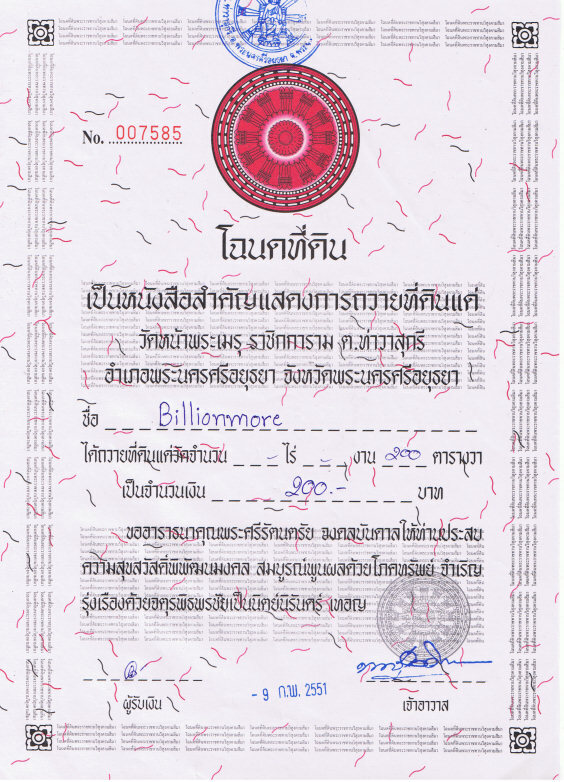 Ceremony: LP Joy blessed this holy ball properly on 3 April 2015. Phra NakProk Pim Bai Makham (Pim Bai Makham: in shape of tamarind leaf) is one of 'Benja Phaki' the 5 famous amulets in Thailand. Phra NakProk has powerful power in protection against harm, dangers and bad things, bringing peacefulness and turning bad destiny to good. 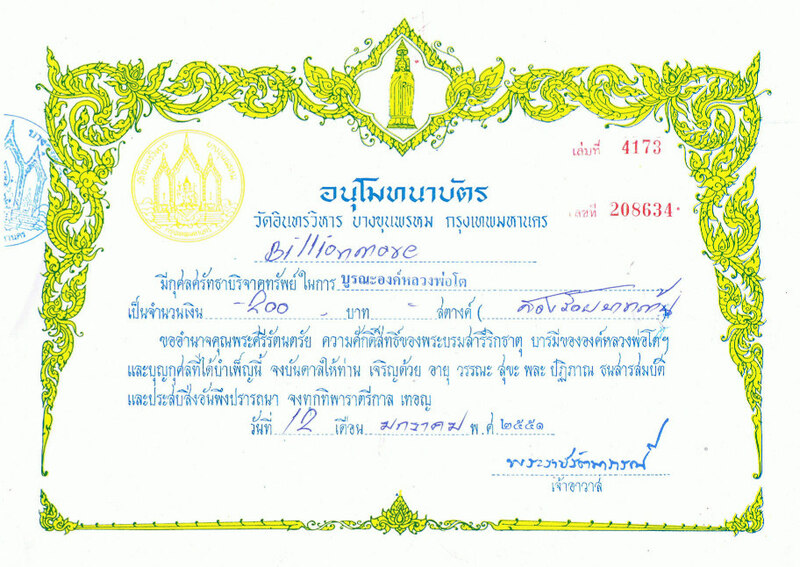 In fact, Phra NakProk is a Buddha image of people born on Saturday. 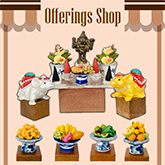 It is propitious for people on this day to worship Phra NakProk in order to enhance their life and fortune. 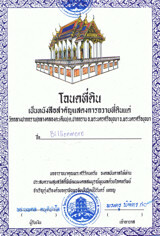 However, worshiping Phra NakProk is also good for people in other days. A chubby Buddha with his hands covering his eyes is well-known as "Phra PidTa", an icon of wealth in Thai belief. 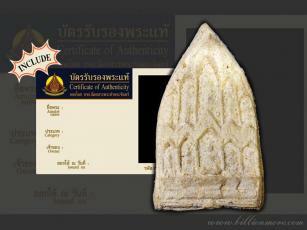 Idea of making Phra PidTa derives from Phra Kawampati or Phra Sangkajjai who was an enlightened disciple of Buddha. With image that looked very much like Buddha, Phra Kawampati transformed himself to a chubby monk so that people will not misunderstand him as Buddha and that became signature of Phra Kawampati or Phra Sangkajjai. Phra PidTa looks like Phra Sangkajjai, but is in a different posture; putting his hands on his eyes that implies an attempt to obtain calmness of mind by stopping seeing. 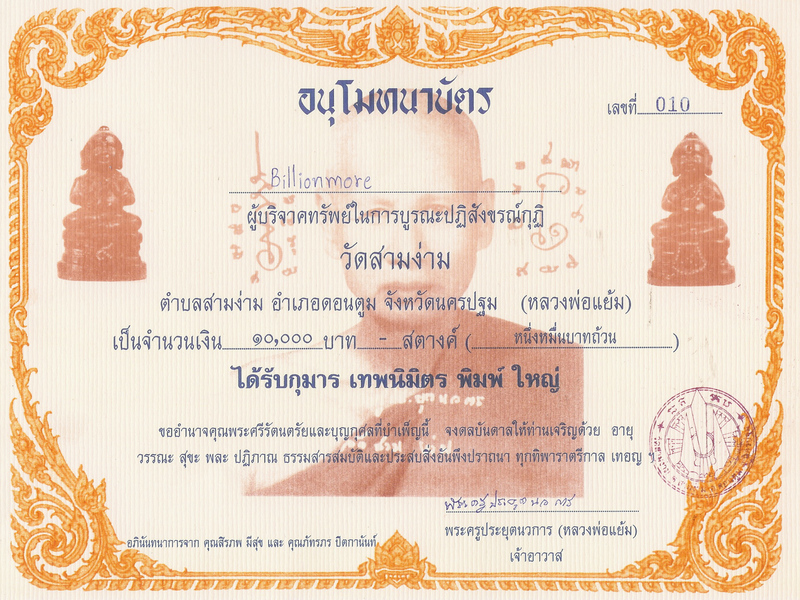 Phra PidTa is praised as god of wealth. 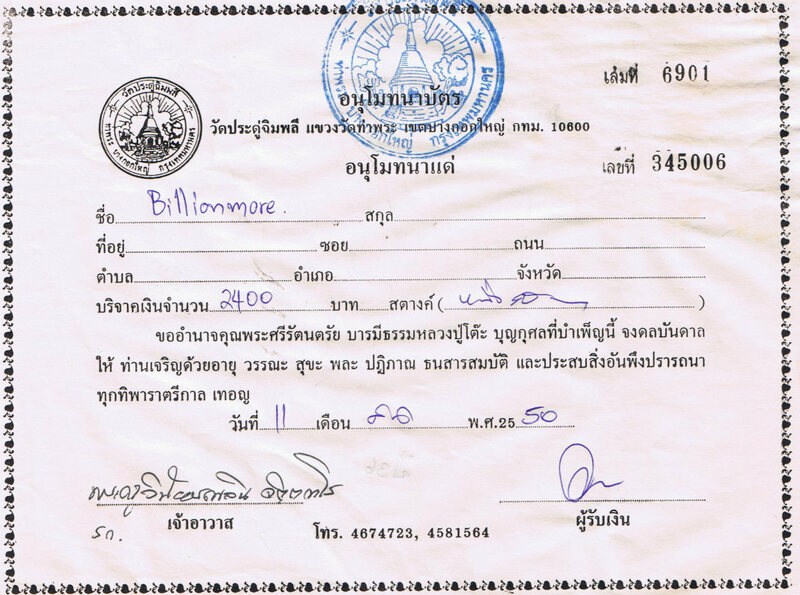 Whoever worships Phra PidTa will be successful in wealth and business. Ceremony: LP Joy blessed this Phra PidTa properly on the auspicious occasion. 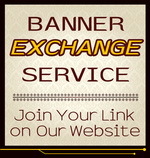 Power: Collectible token full with auspicious power appealing to money and assets. Also, a sacred shield from harm, spirit and bad things. Ceremony: LP Joy blessed this medal properly on 3 April 2015. "Thanks for the prompt sending of the Takrut by LP Nivet. It was nice and thanks for the complimentary plasctic casing too. swae mak mak!"